Everyday, millions of people turn on their computers and try to earn a living in the financial markets. Some are successful, most fail, but the possibility of hitting it big never deters them from trying. In Millionaire Traders, Kathy Lien and Boris Schlossberg interviewed twelve people who started with as little as $1,000 and turned those modest stakes into a six- to seven-digit fortunes. 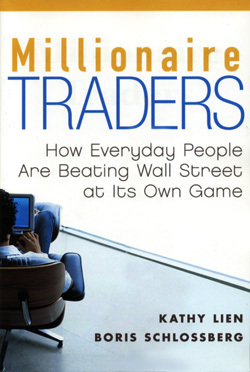 Through these stories of real life success aspiring traders will quickly discover How Everyday People Are Beating Wall Street at Its Own Game.